This was the question we set out with when we started the Safer Handover programme. 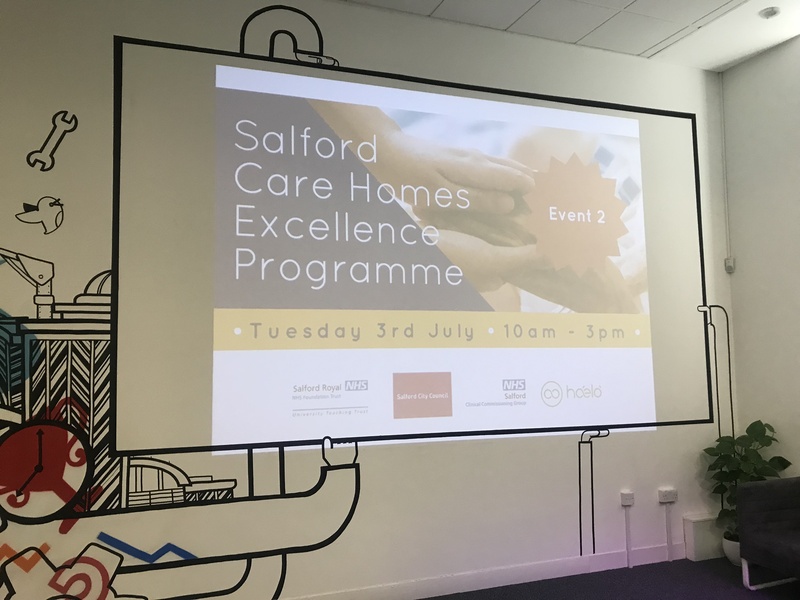 A collaborative review of case notes highlighted that information was not being reliably shared and communicated between different health and care settings in Salford. Health conditions don’t stop when a patient leaves the four walls of a GP practice or a hospital. The need for care and support continues, be it in the form of an additional diagnostic scan, use of prescription medications, or access to specialist advice and treatment. When this isn’t followed up on a patient’s condition may deteriorate, or they may be left wondering what the results from that blood test a few weeks ago were, unsure of where to go for advice. When one link in the chain breaks, it has a knock on impact across the whole system; clinicians and managers are required to invest precious time searching for information and chasing follow-up actions, while concerned patients may present to A&E for help. Lack of interoperability between systems – not only is the built infrastructure of the health and care system fragmented, our supporting systems are equally disjointed. IT is often touted as the saviour of the NHS, but many of our digital systems are inflexible and unable to talk in the same language (how often is a document printed out from one screen, and then scanned in to a different system?!!). Incentivised behaviours – so often handover documents are seen as a thankless task and with targets to get paperwork completed within a certain time. Limited opportunity for genuine two-way dialogue and feedback enables clinicians to begin to feel that the content of a handover document isn’t as important as the fact that it exists in any format. Lack of clarity about what is required – when was the last time the author of a referral was thanked for providing a clear, comprehensive summary of the patient? Some pieces of information on a handover document are more pertinent than others to ensure good continuity of care. Priorities from other perspectives are not always shared and built into the design of the tools we use. By defining and framing “handover” as a safety issue, we can influence how individual health care professionals view their role; not as a lone specialist, but as a link in a chain of continuous care. None of this is new, but projects developed as part of the Safer Handover programme are providing a vehicle for clinicians to make positive changes. 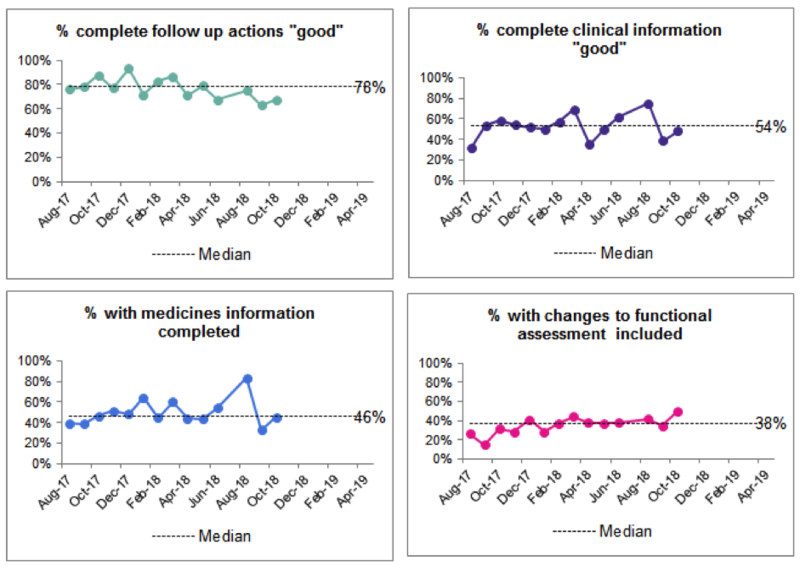 An aggregate measure of these four elements shows that on average only 10% of summaries are completed to “good” standard, with GP feedback informing the definition of “great”, only 1% are currently achieving this quality. This data has informed the design and development of the electronic infrastructure of the discharge summary. Forcing functions can now be added to automatically include any changes to medication documented during a patient’s stay on the discharge summary document. This feedback means we are able to create systems which respond to the needs of all users of the summary, and support clinicians to do the right thing. A number of tests of change and ideas for improvement are now underway and providing valuable learning as part of the SHOP75+ project, such as empowering discharge champions on target wards, developing in-person training and providing access to direct feedback from GPs. This work is ongoing so watch this space to see what has the greatest impact. What do you think is important to improve handover between settings? How can you get involved to improve patient outcomes?